Achaea or Achaia (Greek: Ἀχαΐα, Akhaia; Latin: Achaia), was a province of the Roman Empire, consisting of the Peloponnese, Attica, Boeotia, Euboea, the Cyclades and parts of Phthiotis, Aetolia-Acarnania and Phocis. In the north, it bordered on the provinces of Epirus vetus and Macedonia. The region was annexed by the Roman Republic in 146 BC following the sack of Corinth by the Roman general Lucius Mummius, who was awarded the cognomen "Achaicus" ("conqueror of Achaea"). It became part of the Roman province of Macedonia, which included the whole of mainland Greece. Achaea was a senatorial province, thus free from military men and legions, and one of the most prestigious and sought-after provinces for senators to govern. Athens was the primary center of education for the imperial elite, rivaled only by Alexandria, and one of the most important cities in the Empire. Achaea was among the most prosperous and peaceful parts of the Roman world until Late Antiquity, when it first suffered from barbarian invasions. The province remained prosperous and highly urbanized however, as attested in the 6th-century Synecdemus. The Slavic invasions of the 7th century led to widespread destruction, with much of the population fleeing to fortified cities, the Aegean islands and Italy, while some Slavic tribes settled the interior. The territories of Achaea remaining in Byzantine hands were grouped into the theme of Hellas. In 150-148 BC the Romans fought the Fourth Macedonian War, after which they annexed Macedon, formerly the largest and most powerful state in mainland Greece. In 146 BC the Achaean League rebelled against the Romans. This was a hopeless war as Rome was a far superior military power. Polybius, an ancient Greek scholar, blamed the demagogues of the cities of the Achaean League for stirring nationalism, the idea that the league could stand up to Roman power, fostering a rash decision and inciting a suicidal war. The League was quickly defeated and its main city, Corinth was destroyed. The Romans decided to annex the whole of mainland Greece and Achaea became part of the Roman Province of Macedonia. Some cities, such as Athens and Sparta retained their self-governing status within their own territories. The First Mithridatic War (89–85 BC) was fought in Attica and Boeotia, two regions which were to become part of the province of Achaea. In 89 BC, Mithridates VI Eupator, king of Pontus, seized the Roman Province of Asia (in western Anatolia). Mithridates then sent Archelaus (his leading military commander) to Greece, where he established Aristion as a tyrant in Athens.The Roman consul Lucius Cornelius Sulla landed in Epirus (in western Greece) and marched on Athens. He marched through Boeotia on his way to Attica. Sulla besieged Athens and Piraeus in 87-86 BC and then sacked Athens and destroyed Piraeus. He then defeated Archelaus at the Battle of Chaeronea and the Battle of Orchomenus, both fought in Boeotia in 86 BC. Roman rule was preserved. The commerce of Achaea was no longer a rival to that of Rome. After the defeat of Antony and Cleopatra, about 31 BC, the Emperor Augustus separated Macedonia from Achaea, though it remained a Senatorial province, as under the Republic. In AD 15, Emperor Tiberius, responding to complaints of mismanagement by the Senatorial proconsul made Achaea and Macedonia Imperial provinces. They were restored to the Senate as part of Emperor Claudius' reforms in AD 44. Over time, Greece would slowly rebuild, culminating during the reign of the Hellenophile Emperor Hadrian (117-138). Along with the Greek scholar Herodes Atticus, Hadrian undertook an extensive rebuilding program. He beautified Athens and many of the Greek cities. 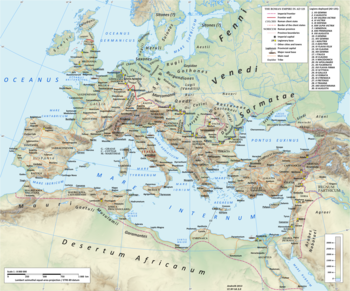 Copper, lead, and silver mines were exploited in Achaea, though production was not as great as the mines of other Roman-controlled areas, such as Noricum, Britannia, and the provinces of Hispania. Marble from Greek quarries was a valuable commodity. Educated Greek slaves were much in demand in Rome in the role of doctors and teachers, and educated men were a significant export. Achaea also produced household luxuries, such as furniture, pottery, cosmetics, and linens. Greek olives and olive oil were exported to the rest of the Empire. ^ The spelling "Achaea" is the most common in English for both the ancient and modern region (as shown by the entries in the Britannica and Columbia encyclopedias and most dictionaries and other reference works) although this is based on an erroneous but well-established transliteration of the Greek original (which does not have a diphthong) and in disregard of the Latin spelling (Achaia) of the Roman province Achaea. At least in some modern scholarly texts, however, the spellings "Achaia" and "Achaea" are apparently used to make a distinction between the Roman province and the northern Peloponnese (see note 2). The transliteration "Akhaïa" of the (Ancient and Modern) Greek is sometimes used in English, for example by the Encyclopædia Britannica and the Collins English Dictionary as an alternative to "Achaea". ^ Unless otherwise noted, governors from 91/92 to 136/137 are taken from Werner Eck, "Jahres- und Provinzialfasten der senatorischen Statthalter von 69/70 bis 138/139", Chiron, 12 (1982), pp. 281-362; 13 (1983), pp. 147-237.